Officially, the NBA has not recognized a Comeback Player of the Year since the 1984-85 season. But these are the dog days of August, this is just an exercise in summer daydreaming and that means, well, we can pretty much do whatever we want. So grab a seat in the shade and let’s run down our handful of candidates for a make-believer honor — the 2017-18 Comeback Player of the Year. This time last year, going into his second NBA season, the Heat had Winslow written into their starting lineup as a mainstay for the foreseeable future. Now, after playing just 18 games before suffering torn labrum in his right shoulder that required surgery, team president Pat Riley is saying it’s entirely up to the young swingman to determine where he fits into the picture. Winslow has all the skills as a defender, playmaker and rebounder to be a Draymond Green Lite (does anybody else really have the attitude? ), even if he never improves his spotty shooting. Comebacks are far easier when you’re only 21, especially when you have all the raw skills of Winslow. Can it be considered a comeback when a guy hasn’t yet played a game in his NBA career? Yes, because it’s an imaginary award we’re making up the rules. Also because Simmons was the No. 1 pick in the 2016 Draft and the expectation level was so high before the Philly jinx bit him with a Jones fracture in his foot foot that cost the entire season. For all the excitement and anticipation around this year’s top choice Markelle Fultz, it’s the possibility of Simmons running the show as a 6-foot-10 point forward that has the Sixers full of hope and fantasy. He did not play in the Summer League at Las Vegas, but Simmons has been working out energetically and even posted a video of himself throwing down a forceful one-handed slam dunk. The biggest free-agent signing in the history of the franchise certainly has the most room of anybody on this list to make a comeback. From his lack of performance over the past three seasons to what has been perceived in Memphis as a lack of caring and commitment, the happy-go-lucky forward has much to deliver. Since leaving Houston in 2014, he hasn’t finished a season healthy. Despite two bad knees, the Griz signed him to a $94 million contract and he spent most of the year on the shelf. With Zach Randolph and Tony Allen gone, coach David Fizdale wants to join the 21st century and pick up the pace and Parson’s game certainly fits that style. He can fill the lanes on the fast break and drop in the 3 pointer. If healthy, he’s a weapon Memphis could use. They used to call it buzzard’s luck when bad things kept happening to the same person. Three seasons into his career and Parker has had two of them cut short already by torn ACLs. 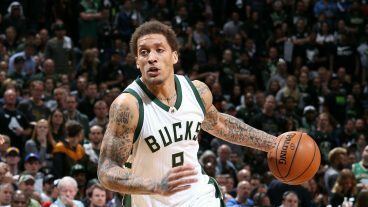 He was scoring a career-best 20.1 points and shooting 36.5 percent on 3-pointers when he went down last season and that injury took some of the starch out of the Bucks drive to the playoffs over the second half. It’s not likely that Parker plays until after the All-Star break and then new general manager John Horst will have to determine if he’s a good fit with budding superstar Giannis Antetokounmpo and Khris Middleton. At 22, if the bad times are behind, Parker can give the Bucks a young three-man core to build around. A healthy Jabari Parker could elevate the Bucks to the next level in the East this season. He was driving through the lane in Game 2 against the Grizzlies when Parker lifted off the floor for a shot and felt his leg give out long before he landed back down. A ruptured left quadriceps muscle ended his season and, some thought at the time, may even his 16-year NBA career. But it was not long before the feisty Frenchman was up on crutches vowing and to make a return. He’s another one that probably won’t make it back until the All-Star break, at best. At 35, the road to recovery is much more difficult. But Parker does not want to leave the game on less than his own terms. Coach Gregg Popovich has been steadily cutting his minutes and therefore all of his numbers. But Pop says it’s Parker’s hand on the offense that keeps the Spurs “centered” and to have him back for the stretch drive would be welcomed.